Nuclear thermal plants could remain used in the long term due to their low carbon profile and ability to provide flexibility to the power grid. The most widespread operation of nuclear plants, however, implies the rejection into the environment of the heat that cannot be converted to electricity. In Pressurized Water Reactors (the most commonly-used reactors today and which should remain so up to at least 2050 ), only one-third of the heat is converted, meaning that two-thirds of the energy is rejected into the environment. It is, however, possible to use part of this heat for e.g. industrial applications, district heating (DH), or seawater desalination. PWR can be designed to provide both electricity and heat (or only heat) without jeopardizing nuclear safety . Nuclear plant-based heating systems have been used since the 1970s in at least 55 locations (e.g. Russia, Switzerland, Norway, Canada), mostly for DH applications (51 out of 55 experiences ). The heat at the steam generator outlet of the PWR is available at 285°C. The whole residential and commercial heat loads, and about one-third of the industrial processes use heat below 250°C . Energy generation in these sectors currently relies mostly on fossil fuels, representing about 7% and 11% of worldwide greenhouse gases (GHG) emissions . Transferring part of the nuclear plant-sourced heat to nearby industrial sinks or DH systems would, therefore, reduce fossil fuel consumption and GHG emissions while improving energy self-sufficiency and long-term price stability. Such systems are, however, barely mentioned in international and national energy scenarios, and remain poorly-used to date. Heat from nuclear plants accounted for only 0.17% in 2014 (0.11 ) of the heat supplied to the European Union’s DH systems . There are many explanations for this low market share. The most commonly quoted is the often long distance between nuclear sites and urban areas. From a technical viewpoint, however, previous research suggests that technical improvements in DH technologies (e.g. low thermal conductivity of modern insulation materials) may make it possible to transport hot water over long distances (up to 100 km) with affordable heat losses (below 2% ). Coupled with the rising awareness of the urgency to mitigate climate change, this has led to a renewed interest. Interestingly, CNNC (Chinese National Nuclear Corporation) is currently considering supplying dense urban areas with heat-only reactors (pool-type, maximum 100°C heat ). 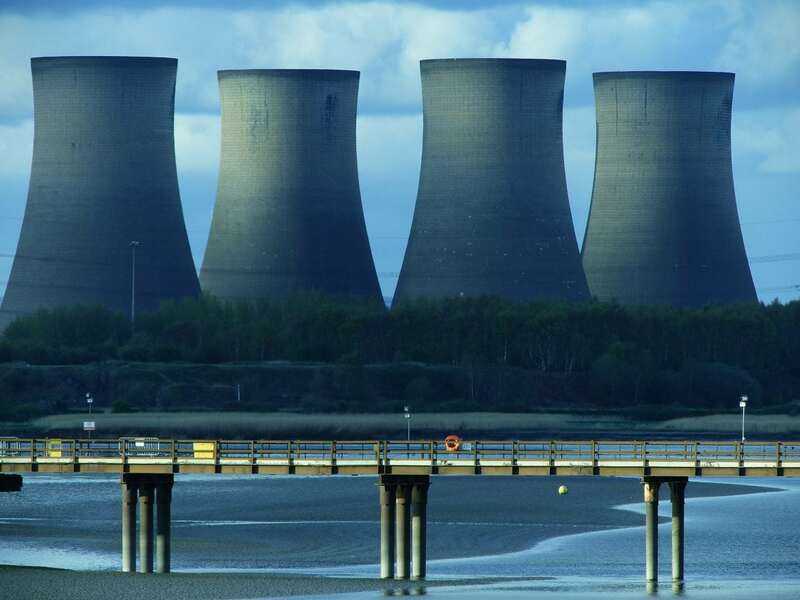 The United Kingdom is focusing on another alternative: small and modular reactors (SMR ) producing both electricity and heat for DH purposes. In the United States, this kind of system is often referred to as a nuclear hybrid system. Several researchers have highlighted their potential, including steam transfer from SMR to biochemical refineries (which are currently burning biomass for power and 250°C heat generation ). Researchers  evaluated the costs and benefits of the systems. Nuclear plants supplying 25% of the cities’ heat loads could be competitive with other heating systems (e.g. natural gas boilers, electric heaters, heat pumps, other DH systems) in 7 cases out of 15. Implementing these 7 systems has the potential to reduce GHG emissions by approximately 10 Mt eCO2/a. By way of comparison, eco-design and energy labeling requirements for space and water heaters (which came into application in 2015 in the EU) are expected to make savings of 13.5 Mt eCO2/a during the 2015-2030 period . Building renovations, modernization of individual heaters, and implementation of low-carbon DH systems should be seen as complementary approaches, acknowledging the fact there is no option superior to others whatever the operational context is. There are, however, high obstacles to the concrete implementation of nuclear plant based heating systems, arising from social, political, institutional, financial and psychological dimensions . Debates about the technical feasibility may be biased by political contests and social ideology. Split incentives may occur, electricity price volatility may undermine the establishment of contractual rules, business models may not be adapted, and electioneering of local authorities may inhibit the will of investing in this alternative. Without adequate energy policies as well as national and local support, the heat from nuclear plants will likely continue to be rejected into the air, sometimes also heating fishes. We encourage the policymakers and stakeholders to seriously consider the deployment of heat production with PWR as a strategic pathway toward sustainable energy systems. If nuclear plants are planned on a site that holds potential for cost-effective heat supply, they should be built as “cogeneration-ready.” Cogeneration readiness can be delivered for a small incremental cost  and would ensure that the plants are ready for a complete cogeneration upgrade when the market, institutional and socio-political conditions are fulfilled. Additionally, the development of DH networks and the co-location of diverse industrial factories within contiguous areas (enabling industrial symbiosis) should be strongly supported through all channels, especially local ones. Note: Nuclear sites are located between 2.3 km and 90 km from the urban area to be supplied. These findings are described in the article entitled Cost-benefit analysis of district heating systems using heat from nuclear plants in seven European countries, recently published in the journal Energy. This work was conducted by Martin Leurent, Pascal Da Costa, and Frédéric Jasserand from the Université Paris-Saclay, Miika Rämä from the VTT Technical Research Centre of Finland, and Urban Persson from Halmstad University. IAEA (International Atomic Energy Agency). Nuclear power reactors in the world. IAEA-RDS-2/37. 2017. STUK (Finnish Radiation and Nuclear Safety Authority). Preliminary Safety Assessment of the Fennovoima Oy Nuclear Power Plant Project. Available from: <https://www.stuk.fi/documents/88234/148256/STUK-Fennovoima_preliminarysafetyassesment_letter.pdf/2b9012c5-0d9a-4253-8efd-c2070fdc2cb7> 2009. Leurent M, Jasserand F, Locatelli G, Palm J, Rämä M, Trianni A. Driving forces and obstacles to nuclear cogeneration in Europe: Lessons learned from Finland. Energy Policy 2017;107:138–50. Leurent M, Da Costa P, Sylvestre S, Berthélemy M. Feasibility assessment of the use of steam sourced from nuclear plants for French factories considering spatial configuration. Journal of Cleaner Production 2018. IPCC (Intergovernmental Panel on Climate Change). The fifth assessment report. Available from:<https://www.ipcc.ch/report/ar5/> 2014. Leurent M, Da Costa P, Rämä M, Persson U, Jasserand F. Cost-benefit analysis of district heating systems using heat from nuclear plants in seven European countries. Energy 2018;149:454–72. Hirsch P, Duzinkiewicz K, Grochowski M, Piotrowski R. Two-phase optimizing approach to design assessments of long distance heat transportation for CHP systems. Applied Energy 2016;182:164–76. EC (European Commission). Communication from the Commission to the European Parliament, the council, the European Economic and Social Committee and the Committee of the Regions. An EU Strategy on Heating and Cooling. Available from: <https://ec.europa.eu/energy/sites/ener/files/documents/1_EN_ACT_part1_v14.pdf> 2016. CNNC (Chinese National Nuclear Corporation). CNNC launches pool-type low-temperature heating reactor. 2017-12-12. Available from: <http://en.cnnc.com.cn/2017-12/12/c_118604.htm> 2017. ETI (Energy Technology Institute) M. The role for nuclear within a low carbon energy system. Energy Technology Institute (ETI). Available from: <http://www.eti.co.uk/the-role-for-nuclear-within-a-low-carbon-energy-system/> 2015. Greene SR, Flanagan GF, Borole AP. Integration of Biorefineries and Nuclear Cogeneration Power Plants – a Preliminary Analysis. Oak Ridge National Laboratory (ORNL); 2009. ETI (Energy Technology Institute). System Requirements for Alternative Nuclear Technologies – Phase 3. Technical assessment of SMR heat extraction for district heat networks. Available from: <http://www.eti.co.uk/library/system-requirements-for-alternative-nuclear-technologies-phase-3>. 2016. Engaged in research on sustainable development, I am convinced of the major role that the energy transition can play in the development of a circular economy and solidarity at the international level. I am particularly interested in energy efficiency practices in the heat sector (eg heat networks, industrial ecoparks); Low temperature heat consumption (<250 ° C) is responsible for one-third of French greenhouse gas emissions.